We offer three worship services every week. Childcare is always provided on Sundays, but children are welcome to attend any of the services. Sermons by our pastors are Biblically centered, seeking to inspire, uplift, inform, and challenge us to be good stewards of both the mysteries and the gifts of God. Special attention is given to crafting sermons that are relevant to the world in which we live. Join us! To view our current worship schedule, click here. 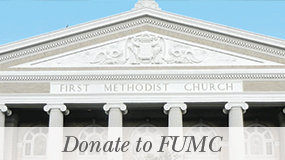 To view our Order of Worship and FUMC Weekly news bulletin, please visit our Newsletters page. This intimate, 50-minute service blends a traditional order of worship with an informal approach. 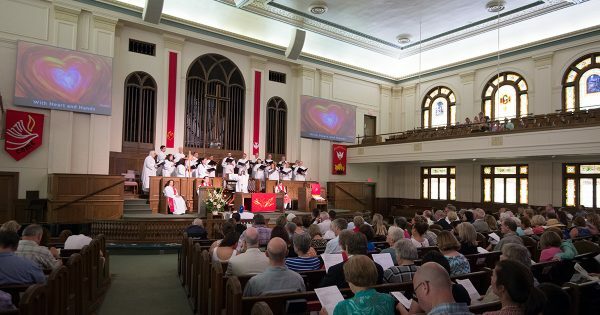 Reverend Taylor Fuerst is the principal preacher and worship is centered on Scripture, drawing together contemporary issues and the best of United Methodist tradition. Both traditional hymns and newer songs are sung by a variety of vocal ensembles, accompanied by piano and violin. The Sacrament of Holy Communion is celebrated each week. This larger, traditional service lasts about 60 minutes. Music is led by our talented FUMC choir and organist featuring traditional church hymns and a variety of musical offerings. Reverend Taylor Fuerst is the principal preacher for this service and leads a time for young disciples, when children can join her at the altar to learn about our Christian faith. The Sacrament of Holy Communion is celebrated on the first Sunday of the month. Learn more about our pastors by reading their biographies: Rev. Taylor Fuerst and Rev. Michael Mumme. Each Thursday at 6:30 a.m., following the Feed My People Breakfast for the Homeless, the Rev. Cathy Stone leads an informal worship service in Garrison Chapel of the Family Life Center. This worship experience is specifically designed to be relevant to our neighbors on the street and to those involved in issues of urban poverty and homelessness. 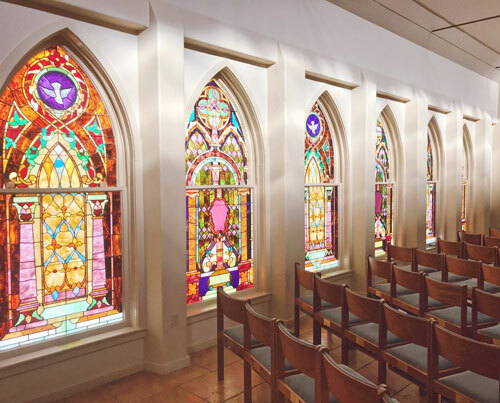 During the week, Murchison Chapel is open for personal prayer and contemplation during office hours, Monday through Wednesday, 9:00 a.m. to 5:00 p.m. and on Thursday, 9:00 a.m. – 3:00 p.m.
Contemplative prayer can provide a welcome respite, a place to find the inner resources to actively serve a chaotic world from a place of strength and peace. These services are offered on 4th Sundays and planned for the beginner or experienced practitioner of mindfulness meditation. 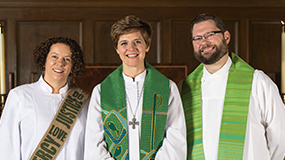 Watch our Welcome Video and learn more about the ministries of FUMC and meet our pastors.